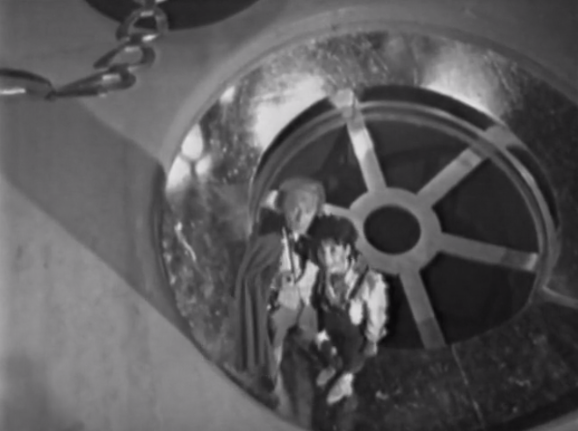 The first serial ever developed for the Doctor Who series was an idea from writer C.E. Webber called The Giants, which would have seen the Doctor and his companions being shrunk for a Honey, I Shrunk the Kids / The Incredible Shrinking Man sort of adventure. The Giants ended up being pushed aside in favor of 100,000 B.C., and the characters never did get shrunk during the first season. So now we've reached the first serial of the second season and the shrinking finally happens, although Planet of the Giants was written by Louis Marks, not Webber. 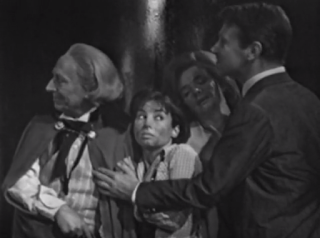 The serial begins with the otherworldly Doctor (William Hartnell) and his travelling companions - his granddaughter Susan (Carole Ann Ford) and 1960s England school teachers Barbara Wright (Jacqueline Hill) and Ian Chesterson (William Russell) - once again making their way through the clunker of a time and space-travelling machine called the TARDIS, which is still stuck in the form of a police box. 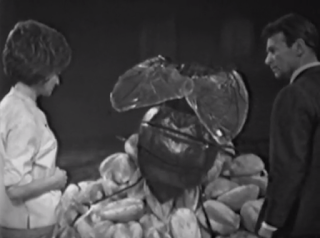 The TARDIS starts to overheat, the doors dangerously swing open in the middle of their arrival, and the machine ends up materializing in exactly the time and place Barbara and Ian would hope to be in: 1964, England. Problem is, when they exit the TARDIS they find that they are very miniscule in size. Even the insects and worms they encounter are huge beside them. More troubling than the size of these creatures is the fact that they're all dropping dead. The travellers have had the misfortune of showing up at a country home where an insecticide called DN6 is being put to use by a man named Forester, who intends to get rich with the mass marketing of the product. When a scientist named Farrow informs Forester that he will stand against the use of DN6 because it's too deadly, totally destructive to insects that make a vital contribution to agriculture, Forester shoots the man dead. Factories and advertising are already in place, if DN6 doesn't go into production Forester will be ruined. 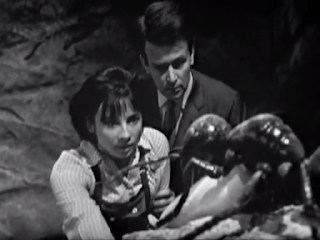 The episodes (Planet of Giants, Dangerous Journey, and Crisis) cut back and forth between Forester's criminal deeds - the killing of Farrow, the disposal of the body with the help of a scientist called Smithers (who, unliked Farrow, wants DN6 to go into production, simply because he's spent so long working on it) - with the Doctor and his cohorts making their way through the standard shrunken people scenarios of getting stuck inside things like a briefcase, making their way through small spaces like a drainpipe, facing off with a hungry cat, etc. There is a great cliffhanger where the Doctor and Susan are stuck inside a draining sink, and there's a ticking clock element in play, as Barbara is poisoned by DN6. To survive this, she needs to get back to her normal size, as the dose of DN6 affecting her wouldn't be lethal to the average person. The characters can only hope that the TARDIS will actually materialize them at their normal size next time they jump through space and time. Planet of the Giants was actually filmed during the production of the first season and held back until the second. Taken on its own as part of the big picture of Doctor Who, it's a fine enough serial that shows the viewer some fun things and lasts just long enough. The original plan had been for it to last for four episodes, but episodes three and four were combined into one, which I believe was for the best. Four episodes of this would have been too much. Apparently a good amount of what was cut out was more stuff with the switchboard operator characters make calls through and her policeman husband, which would have been unnecessary padding. 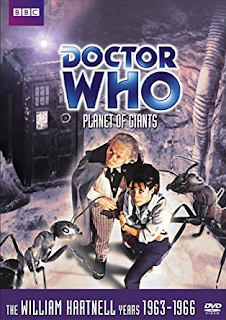 As the start of a new season of Doctor Who, Planet of Giants is kind of weak, as the concept is bland when you take into account the potential of the series. The show can explore alien worlds or dig into historical events... and here the characters are just in a house in the English countryside. There's a reason The Giants wasn't the first serial in season one, and it's a little surprising Planet of Giants was chosen to be the start of season two. Not every serial can be an epic, though, and obviously everything turned out just fine. The next serial, that one's an epic.